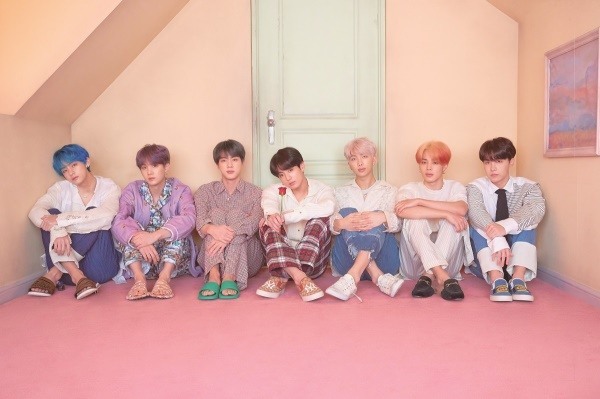 BTS scored two nominations at the 2019 Billboard Music Awards, according to Billboard on Thursday. The seven-member K-pop band is in the running for Top Social Artist and -- for the first time ever -- for Top Duo and Group. The other contenders for Top Duo and Group are the Imagine Dragons, Maroon 5, Dan + Shay and Panic! At The Disco. The boy band has already snagged the Top Social Artist trophy for two consecutive years. This year it is up against fellow K-pop groups GOT7 and EXO, as well as US singer Ariana Grande and British singer Louis Tomlinson. It marks the first Billboard nomination for GOT7 and EXO, which also have loyal fandom communities. Other nominees for this year’s awards show -- set to take place at the MGM Garden Arena in Las Vegas on May 1 -- include Cardi B, who is leading with 21 nominations in 18 categories, as well as Drake, Travis Scott and Post Malone. Immediately after the announcement, BTS fans, known as the BTS Army, took to social media to congratulate the band on this milestone. Hashtags like #BTSBillboardTopGroup and #BTSPavedTheWay are trending worldwide on Twitter. The boy band’s new album, “Map of the Soul: Persona,” is slated for release April 12.